I can easily say that my favorite food is tacos. I love that you can eat them as breakfast, lunch, snack, dinner, or dessert. I love that you can make them a million different ways. I love that avocado is always involved. I can confidently say that these will not be the last tacos that you see on this blog. Fun Fact: in 2010, I had a food blog. It was more of an Online Food Diary, to be honest. I started it with the sole intent of having an online recipe book, because I was always losing the recipes that I wrote on paper. I'd write a little about the inspiration for the recipe, I'd share a (really bad) photo or two, and I'd post. I didn't tell anyone about it and I certainly didn't promote it. In the end, I posted over 50 recipes and wrote for a little over a year and a half. I recently logged in to grab a recipe, and noticed an "Analytics" tab. I clicked it out of curiosity, and was blown away: in the past month (this is almost six years later), I had over 350 hits. I had just under 100,000 hits all-time. I had numerous comments asking me to please consider starting a blog again! Even funnier: my first post mentioned a specific celebrity chef, who has since taken my class at Flywheel Sports! I am telling you this for a two reasons: (1) I am humbled. I had no idea so many people found and enjoyed my blog! (2) One of my most popular posts was a recipe for Sweet Potato Burritos, that really are something I go back to again and again. Since it was so popular on my online-diary-blog, and because tacos are the best, I decided to remix it for my first taco post on this blog. This post is dedicated to everyone who came across my old food blog and followed along, and to all of you who are doing the same now! Thank-you! 1. Warm a large skillet over medium heat, and add coconut oil. 2. Add diced sweet potatoes to skillet and saute for 5 minutes. Stir occasionally. 3. Add thinly sliced onions and garlic to skillet and continue to saute until onions are slightly translucent and begin to caramelize. Add pulled mushrooms and stir to combine. 4. Add black beans to skillet and mash with a potato masher. Slowly stir in the vegetable broth. 5. Lower heat, add soy sauce and spices, and continue to stir. It should be quite thick (add a splash of vegetable broth if it gets too thick). Set aside. 6. For the avocado crema, simply combine all ingredients in a blender and blend to combine. If you like cilantro, add a lot! If it is too thick to blend, simply add a little more olive oil. 7. Warm tortillas for a few seconds on each side in a skillet. 8. Assemble! 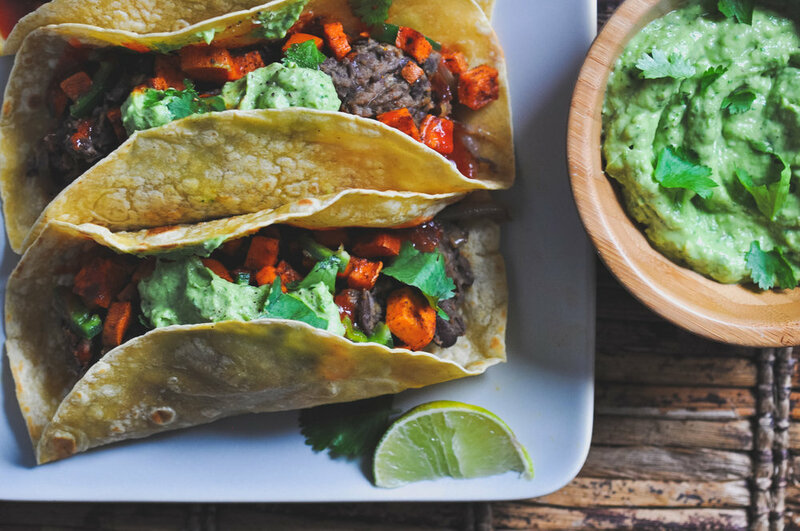 Start with the bean and mushroom mixture, top with sweet potatoes, and top that with avocado crema. Drizzle with Sriracha and garnish with extra cilantro and a lime wedge. 1. Heat 1 Tablespoon Coconut or Olive Oil in a skillet over medium heat. 2. Add whole mushrooms to pan, stirring constantly. 3. Cook for 5-7 minutes. This will vary on the size and type of mushrooms that you use. You're looking to make them tender and slightly brown. Set aside to cool. 4. Once cooled, take the back end of a fork and "pull" down on the mushrooms. This will create a really wonderful "pulled pork" texture. You can also mash the mushrooms with the back of your fork if you end up with big pieces.